In late 2013 Nokia pulled the plug on its Here Maps for iOS because, well, it just wasn’t very good. After a successful launch on Android, Nokia has brought its app back to iOS and this time it’s built from the ground up for a great, native experience (the old one was a packaged HTML5 app). The new app comes with all the bells and whistles, including offline navigation and public transport. The app can work perfectly fine in airplane mode with no roaming data as you travel abroad. It will plan routes and offer voice guidance with spoken street names. You just have to download the country app before you leave home. If you do have some data, you’ll also get traffic information in 44 countries. 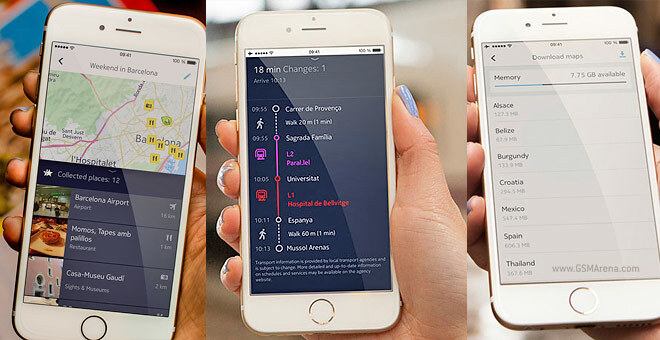 If you don’t have a car, Here Maps will guide you on foot or tell you where to take a bus, how long until you arrive, guide you through any transfers along the way and tell you when to get off. You need an iPhone 4S running iOS 7 at minimum. You should be able to download the app from the Apple App Store, though it might not be available right away due to some technical difficulties. As for the Android app, it just crossed 4 million downloads. That’s up from 3 million downloads at the end of January. Here Maps is also on Tizen devices – the Samsung Z1 phone and Gear S smartwatch.